This is a die-cut Ton-Gors Feed porcelain sign. This particular Ton-Gors Feed sign is predominantly red and yellow with white and black text. 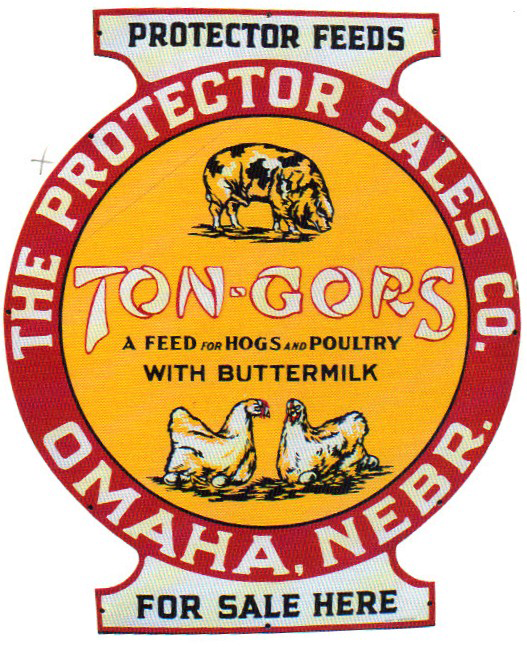 It reads, “Protector Feeds, Ton-Gors, A Feed for Hogs and Poultry with Buttermilk, For Sale Here, The Protector Sales Co., Omaha, Nebr.” and features a hog at the top and two hens laying eggs at the bottom of the sign.